This is one of those recipes that shouldn't be as good as it is, but it's delicious. You're supposed to use a baguette for an appetizer-type experience, but I used a larger French sourdough loaf for a light dinner kind of situation. And my broccoli might look burned, but it's DELICIOUS. If you've ever made kale chips, you'll appreciate the broccoli. Even if you've never had kale chips, you'll appreciate it. It might seem like a lot of work, but it's fully worth it. Make these to bring to a potluck, and you'll find your popularity rising by a multiple of 100. Arrange bread slices on a rimmed baking sheet and drizzle with 2 Tbsp. olive oil. Toss to coat, and re-arrange in a single layer. 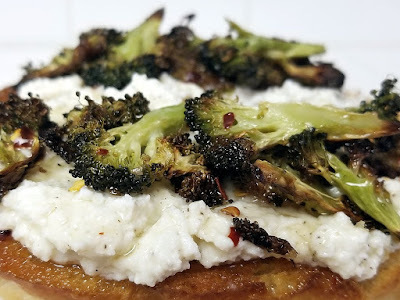 Put the broccoli and garlic on another rimmed baking sheet, and toss with remaining 4 Tbsp. of olive oil and salt and pepper to taste. 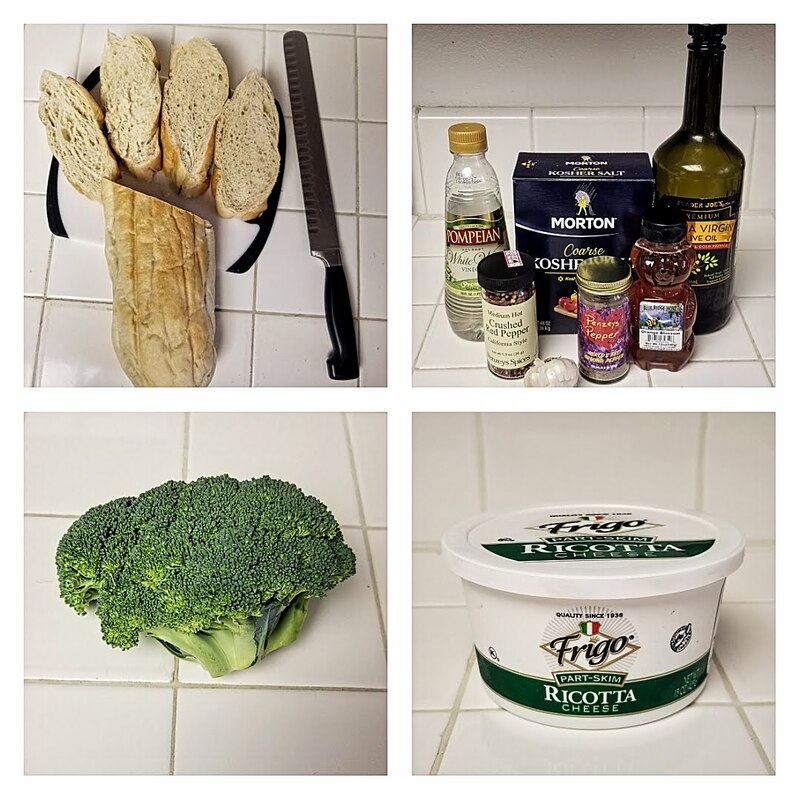 Place broccoli on the top oven rack and the bread on the bottom. Rost until bread is golden brown, 10-12 minutes. 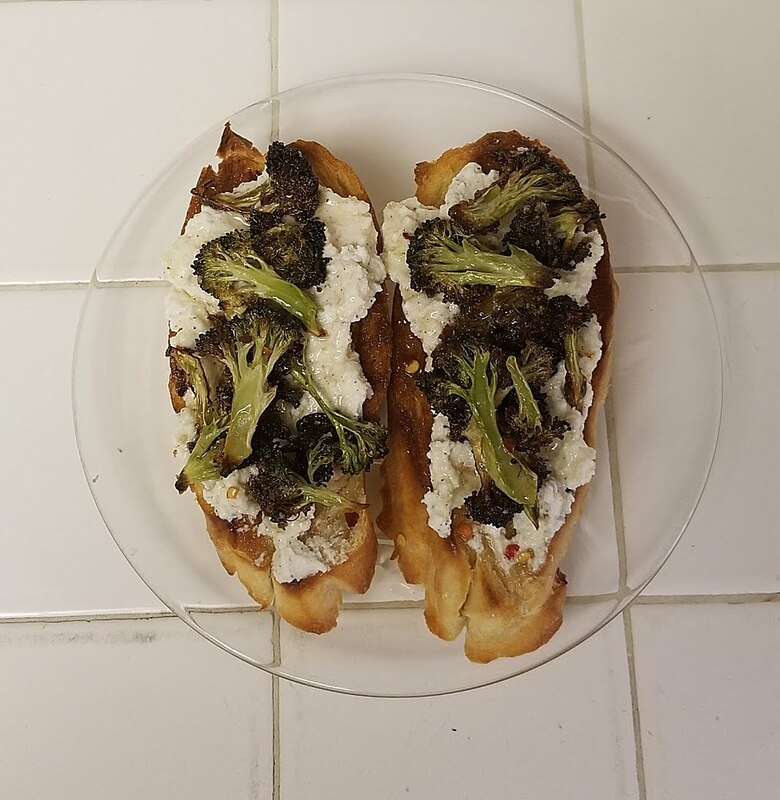 Remove bread from oven and roast broccoli and garlic another 15-20 minutes until broccoli is browned and garlic is tender. Let cool slightly. While the bread and broccoli are in the oven, whisk honey, vinegar, and red pepper flakes in a small bowl. When the garlic is cool, squeeze cloves out of the skins and mash in a small bowl to form a paste. Add ricotta and combine well, adding salt and pepper to taste. Spread the ricotta mixture over the toast and top with broccoli. Drizzle with hot honey and serve.